Driving solely controlled by the brain, a morphing chassis and a cockpit that would look at home in a fighter jet: this is racing giant McLaren's vision for the future of motor-racing - the MP4-X Formula One concept. 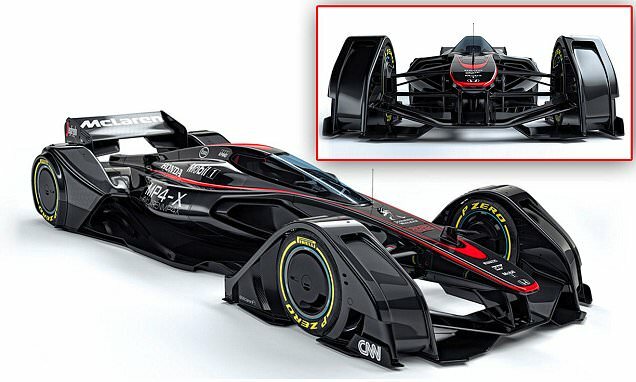 Even with preparations for next season under way, McLaren's thoughts are already turning to years down the line with a new Batmobile-lookalike F1 car that utilises existing technology that could transform the sport when it reaches its full potential. The design draws in current developments of the sport, such as the desire to provide protective canopies for drivers, while upgrading its core values of speed and excitement through development of almost every element to form a visually-stunning, technologically-advanced vehicle. 'With the futuristic McLaren MP4-X concept race car, we wanted to peer into the future and imagine the art of the possible,' John Allert, group brand director of McLaren said. 'We have combined a number of F1's key ingredients – speed, excitement and performance, with the sport's emerging narratives - such as enclosed cockpits to enhance driver safety, and hybrid power technologies. It certainly does that. In addition to the protective canopy, other features of the car include tyre sensors that could warn of dangerous blow-outs before they occur, a race suit that would be able to transmit live biological information to the team and solar cells to supplement on-board systems or be used as a boost.